Offended by the title? Well don’t be because the full title is supposed to read “7 Laptop Bags You Can’t Afford To Waste Your Money On Because You’re Starting A Business!”; but obviously such a title would require its own blog post so I had to revert to some self-journalistic misquoting. Anyway let’s take a look at some lavish laptop bags you shouldn’t be shopping for unless you’re an oil-rich Sultan or your debt is falling short of the national average. Knomo’s expandable Bremen laptop traveler bag will only set you back a cool $375, which makes it the least expensive laptop bag of the bunch. At the very least, you get a roomy bag complete with Knomo’s tracker system which reunites you with your lost bag, assuming that the person who found your bag begrudgingly calls in to report it. Knomo also offers other laptop bags for both men and women, but none can carry a small child in it like the spacious and expensive Bremen can. Starting at $500, Vaja builds this and all their laptop cases by hand while offering a variety of color combinations and personalization options – all at an additional price of course. According to Vaja’s site, their full grain cowhide comes from the top 10% of Argentina’s leather producers and this particular special edition case is dressed in a high-end premium Renato leather skin. Zero Haliburton’s $575 wheeled aluminum computer case is lined with a shock-absorbent foam interior and features heavy-duty draw bolt latches and a strong aluminum exterior to protect your laptop from just about anything short of a point-blank gunshot. Actually, this computer case is quite affordable when compared to the $2250 carbon fiber carry on case they sell. 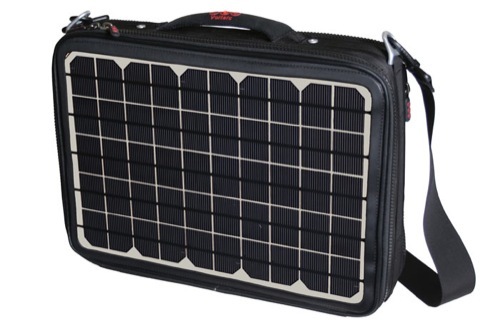 Although I said that you shouldn’t be spending big bucks on any of these bags, the Voltaic Generator by Voltaic Systems is the only bag that I would actually spend some money on. The aluminum frame is covered in fabrics made from recycled water bottles and the solar array can generate enough power to charge a laptop along with your other electronic devices. It’s the ultimate in geek and eco-friendly gadgetry, and it will set you back $599. A padded laptop compartment and full organizer qualifies this $725 ‘brief bag’ as a computer case. 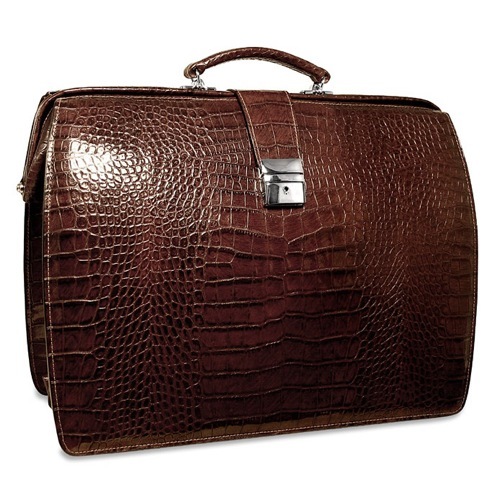 Also featured is a key lock, polished nickel hardware, and a hand stained croco-embossed calfskin exterior made from the finest tannery in Italy – which according to Google’s search results is a claim that hundreds of bag producers make yet do not elaborate on. 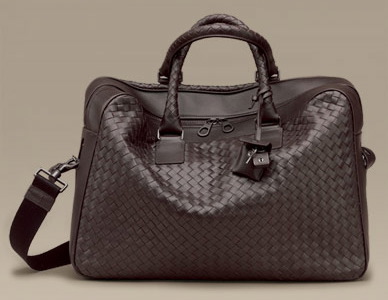 I’m not even sure if this qualifies as a real laptop case or BOTTEGA VENETA decided to call one of their purses a laptop bag. Either way, $2350 will land you this rather plain looking laptop case/bag with cotton lining and detachable shoulder strap – *yawn*. Actually, the lack of any coolness factor is why I almost omitted this bag, and decided to definitely omit the $1000+ Prada Ombre Laptop Bag which basically looks like something Hello Kitty coughed up. 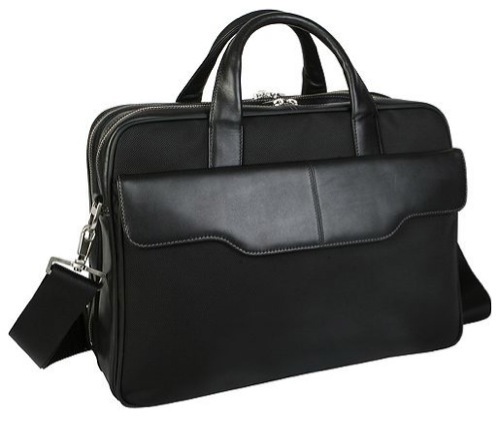 Get ready because for only 2240 British pounds, which comes out to approximately $4354 US dollars (calculated on 05/13/08), you can own a carbon fiber hand-crafted Calder laptop case which takes more than 24 hours to wrap in Swedish Tarnsjo leather. As you know, carbon fiber is 5 times stronger than steel while still being lighter than aluminum, so your laptop will be sitting pretty in one of these babies. And if you need more reassurance, additional protection is added through a suspension pad that consists of open cell foam, closed cell foam, and visco-elastic ‘memory foam’. Admittedly, some of these laptop bags are serious high-end products that merit some applause and envy. Yet, hopefully by now you understand 1) I’m really bad at being sarcastic, and 2) there are some luxuries you can afford to pass up when starting your business. Now, of course I wouldn’t make a list of laptop bags you shouldn’t buy without making a complimentary list of affordable laptop bags you should buy – that’s not how we roll on The Closet Entrepreneur. So for all you faithful readers and subscribers, stay tuned for my future blog post featuring stylish yet affordable laptop bags for you and your business… I’ll start writing the post as soon as I get the visions of the Prada Ombre laptop bag out of my head. Until then, feel free to share any ridiculously expensive laptop bags I may have missed by leaving a comment! I have a vaja case for my palm pilot. Unfortunately i have a palm pilot but the case is really super nice. I would definitely consider buying another one of their products if i needed to look like a badass. Though if you pulled out some crappy gateway or something the image would be lost. no kidding. who’s buying this stuff?! I had a great backpack for my PC that was not expensive, but one of the straps broke. I returned it to the manufacturer and they replaced it. About 6 weeks later the other strap broke, fixed again. I would use that pack for about 2 months then ship it back (gone for a month) for about 3 years. They never complained and always paid shipping. Crazy. That one I could afford. $4354.00 I can’t! @Rita – I’m thinking the same thing as you are, but then again some people will dish out wads of cash for anything unique and different so it doesn’t surprise me. Actually, making some high end laptop bags for the individual that has it all might be an interesting business idea don’t you think? @Richard – Sounds like you got lucky and unlucky with your current laptop bag. I received a BBP street flow laptop bag for my birthday and absolutely love it (and highly recommend it too)! Actually, I was hoping to get two of those Calders. Too cool to have just one. In all honesty, the pricier the case, it seems the less functionality it brings. What I’ve been looking for for years is an accessories sleeve that could hold ALL my adapters, transformers, etc., and fit in whatever laptop case I use. It always seems to be a rat’s nest at the bottom of my case. I have a Logitech case that’s done pretty well, and an Oakley that has several external pouches for stuff. But if anyone’s seen such a sleeve or case, I’d like to hear about it. @jeff zbar – As I mentioned in a previous comment, I’m using a BBP street flow laptop bag and really like it – although I’m only packing a laptop, AC adapter, mouse, and a set of headphones. As for a sleeve with external pockets and decent storage, I’m not aware of any that are uber versatile but you may want to check out the AppleSac, the HardCase, and the Spire Sleeve Series. The latter two are defined as ‘sleeves’ but they’re a bit larger than a regular sleeve. Hahaha. How did you know I was looking for a protective laptop sleeve today. Whew! Those bags are really something. Especially The Laptop Case by Calder. It looks good, formal and attractive. The price? – $4354… I don’t think I can afford that. But it’s really nice… What’s its weight? It looks heavy. I’ve asked three accountants, and all say that if a handbag is big enough for your laptop it is a tax deduction! My 12 inch G4 Macintosh used to fit in almost anything, but I still have a nice leather number with a velvet lining just made for my Mac Book Pro. @Lightning – I believe the Calder shouldn’t be too heavy since carbon fiber is quite light – which justifies its cost and use on race cars and high performance autos. Not sure if you were aware of the new BMW M series that come complete with a carbon fiber roof. Although I agree with you for the most part, spending buku bucks on a laptop case is not always such an extravagance. I’m reminded of that motorcycle helmet company that came out with a hot marketing campaign in the late ’90’s: “If you’ve got a ten-dollar head, buy a ten-dollar helmet.” Point well-taken. If your laptop (or, rather, the content within) is highly valuable, why not protect it accordingly? Just my 2-cents. @laptop-carrying-cases – I definitely agree, spending buku bucks on a laptop case or even laptop for that matter isn’t always an extravagance, and that’s why I note that for the most part I’m being sarcastic in my blog post. These cases are great but i guess people are paying for fashion at this point and not the bag. The only one I can see that would be worth it is the Voltaic Generator. People on the go all the time are really going to need this feature. Recently picked up a carbon fiber case for my 13″ Mac. Very solid and light. My name is Kevin and I am the president of Mach 3 Composites. 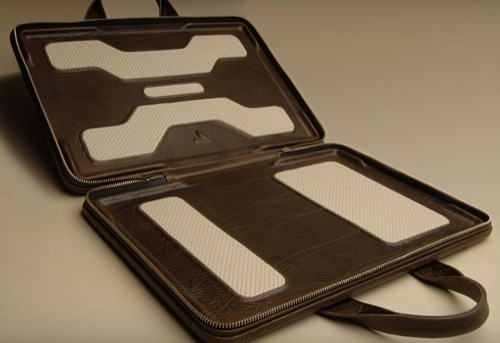 We craft carbon fiber cases for laptops and IPADs. 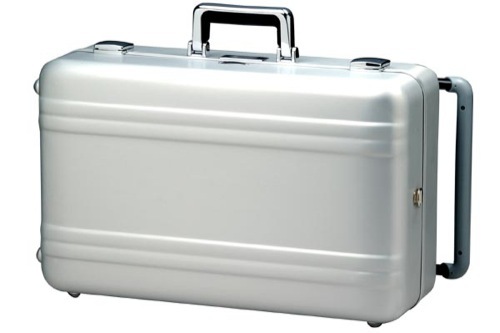 All cases are hard shell, light weight, checkpoint friendly, padded and lined. We would love for you to check us out. What do you think about it? It seams really cool for me.